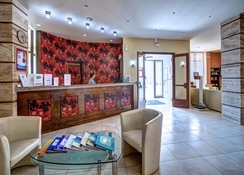 This family run hotel is ideally located, close to St. George's vast sandy beach and within a few minutes walk of the resort's ever increasing number of shops, tavernas and bars. The guest accommodation is comfortable and the team at the Golden Sands extend a warm and hospitable welcome to their guests (security deposit payble upon check-in). A great choice for a lazy sunshine holiday. Restaurant, swimming pool, poolside bar, leisure activities including tennis courts, currency exchange and satellite TV lounge. Safes are available in Reception at extra charge. 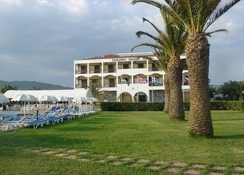 Twin bed rooms with a bathroom, telephone, air- conditioning (extra charge) and balcony with either a sea or hillside view. Lovely staff. Rooms good. Comfortable beds. Near beach, shops and restaurants. Lovely pool. Food could be better, edible but could vary in veg and meat. We stayed here in May 2017. The hotel was nice with the basic essentials which was ok for us. George was very accommodating and welcoming towards the guests. He gave the holiday the holiday extra enjoyment. Hope to come back next year. The staff at the hotel were very helpful and friendly. The food suited my pallet as I’m vegetarian so I was looked after very well by the catering and waiting staff. I was upgraded as I had a noisy couple next door to my room, my room was swapped very quickly and the reception staff wee most gracious. The hotel is directly across the road to the local beach which is a little rustic but just how I like it as a solo traveler this hotel and its location suited me down to the ground. Local people very warm and friendly and food is lovely as is the weather and atmosphere of the area. I will return again for my 3rd year. I loved it! everything was pretty much average about my holiday!